Bienvenue dans notre chalet de concept ouvert fraîchement rénové avec tout le confort de la maison. Situé au cœur de la vieille ville de l'UNESCO, à seulement 5 minutes à pied des nombreux magasins, galeries et musées de Lunenburg. Avec plus de 30 restaurants le long du front de mer historique, vous aurez l'embarras du choix, alors pourquoi ne pas commencer avec un café tranquille ou un homard frais à partir du bateau. Le chalet a une sensation de fraîcheur moderne avec un grand plan ouvert cuisine bien équipée et salle à manger, le soleil rempli salon avec un canapé-lit, une grande chambre avec un grand lit, salle de bain avec douche à l'italienne, pont arrière avec des sièges et une réception paysager jardin avec parking hors route. Marchez dans la douche en verre. Dave and Pam Adams' property at 135 Lawrence St. in Lunenburg was a home away from home. For me, it was the perfect combination of vacation spot and writer's retreat. It was clean, comfortable, quiet, tastefully decorated—and it had a luxe shower to boot! I didn't have a car during most of my stay and it was a short walk to all of the shops, the waterfront, the famers' market and the library at the Lunenburg Academy (the short but steep hills were a great workout). I wouldn't hesitate to stay here again—in fact, I can't wait to return. Charming, comfortable, tasetefully decorated and spotlessly clean. 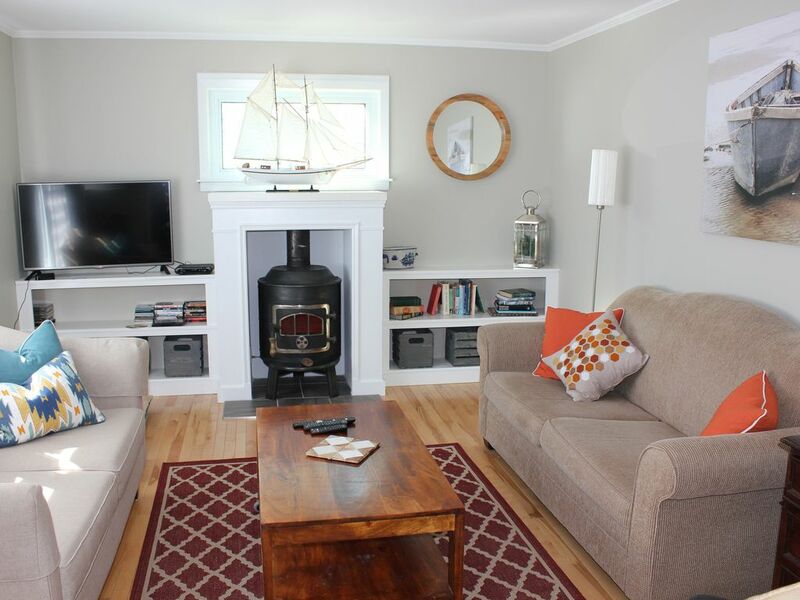 Set in a quiet but central location in Lunenburg, we loved everything about this home. It was a delight to stay here and we highly recommend it. Wonderful little cottage in a great location. Could walk to anything in old Lunenburg. Well furnished with great consideration for guests. Hosts were very helpful - ensuring we had all the details we needed beforehand, and with recommendations whist we were there. Particularly liked the code entry system for the cottage - gave us great flexibility. We can't wait until our next visit to Nova Scotia! We enjoyed this place because it was a short walk into Lunenburg, but allowed us to have our own place to retreat to. The entire place was up to date & detailed well. Lots of space, didn't spend any time on the back porch, but who needs it when your exploring the area anyway. Highly recommend taking a trip to the point of Blue Rocks where there is Kayaking, Great Views, and a great little general store. This unit is one if the best vacation rentals we have ever stayed in. It was beautifully furnished, extremely well updated and very clean. The hosts were very attentive and paid very close attention to detail. It had everything we needed and more. Its in a great location within walking distance to downtown. Pam and Daves' cottage was immaculate and had everything we needed. It was like having a home away from home. The location was perfect; walking distance to the pier and shopping district yet far enough away to have quiet mornings and evenings on the deck. We absolutely loved it!